Go, Go, Fight with all your might! Get more friends to cheer with you with our Pittsburgh Steelers Invitations & Thank You Card Set, you get to invite your friends to start it off and you'll be sure that you'll be able to thank them by the end of the event. Invitation: Features a black football helmet with the official Pittsburgh Steelers Logo against a yellow football field background with the word "Party!" against a black background. 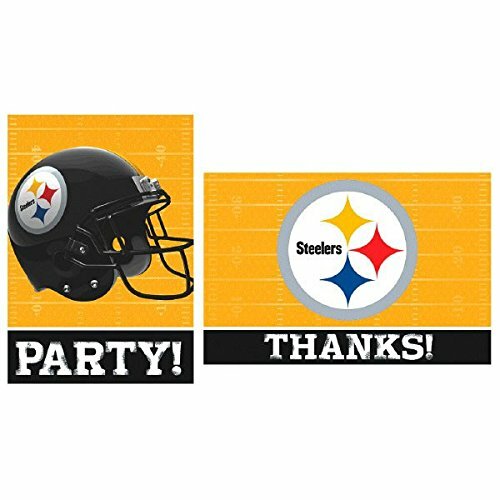 Thank you card: Features a print of the Steelers logo against a yellow football field background with the word "Thanks!" against a black background. Includes 8 folded invitation cards with envelopes. Includes 8 Thank you cards. Purple Vintage Floral Set of 25 Fill-in Invitations and Envelopes for Bridal Showers, Baby Showers, Birthdays, Graduations, Dinner Parties, Soirees, Rehearsal Dinners and Bachelorette Parties.